Indeed there is a quite obvious 'disparity' between the two top root sheetings. Above is a 'revealing' close-up, but I can't really figure out how such an accurate and neat modeller didn't spot his mishap before covering the wing. Congrats again, Paul. But, please check your Vicky's build bookmark properly. Hi Chris, I think I screwed up the bookmark while on holiday using my phone. Small screen big fingers , it was never going g to end well , all fixed now. A wise man once told me that the only people who don't make mistakes are the ones that never do anything . 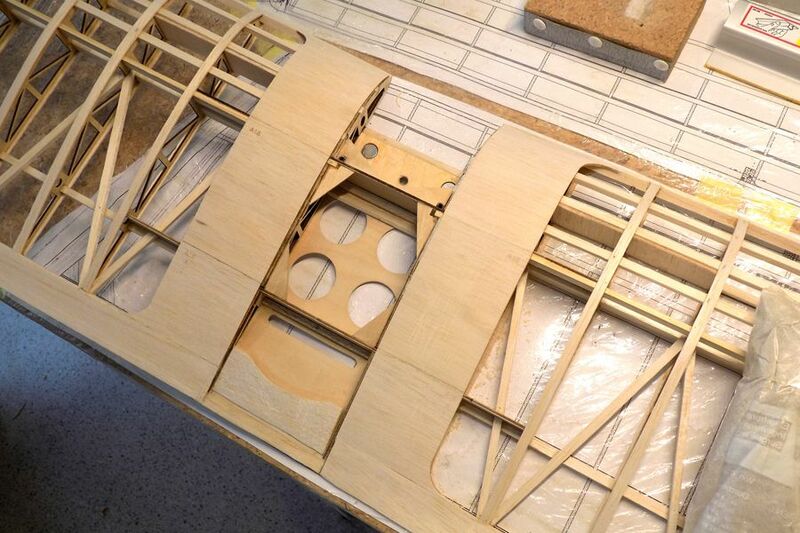 Nice progress with the second wing as it is ready now to be joined to the center section after the wing tip was added, sanded down to shape... and the bottom cap strips are now curing. 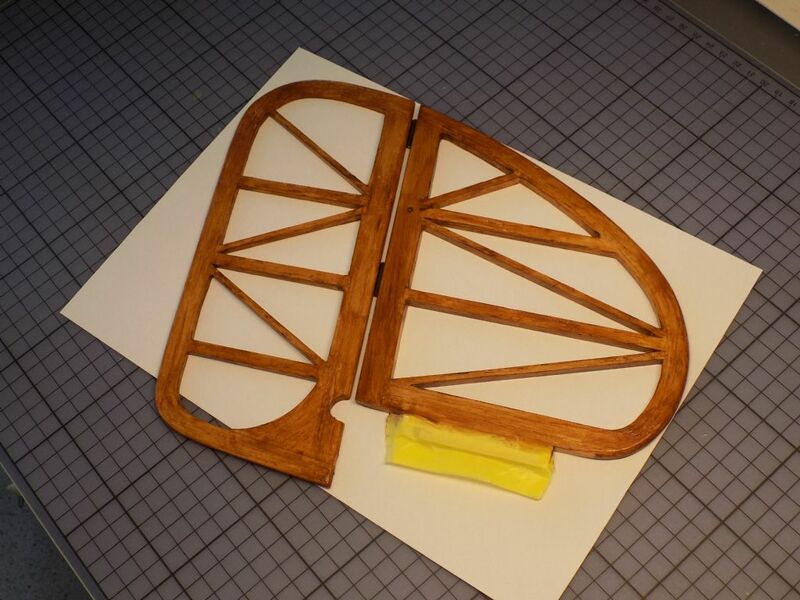 I prepared some jigs to check the dihedral but the one from the Svenson plan indicates 36mm at the internal rigging hard points while the Vicomte 1916 plan is showing a 75mm jig at the last perpendicular rib close to the wing tip… so, I decided to make both. 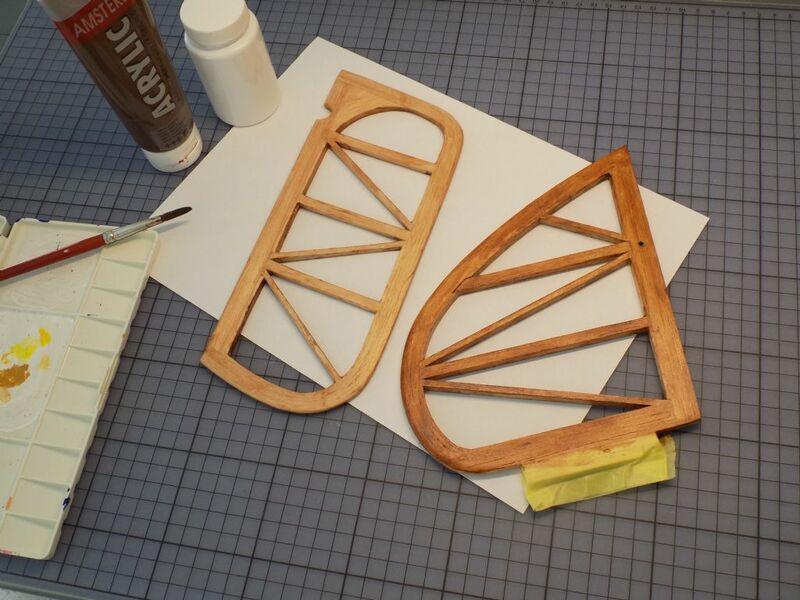 While I was adding bits of balsa to the second half wing, I easily could concentrate on some other parts while the Aliphatic was curing. 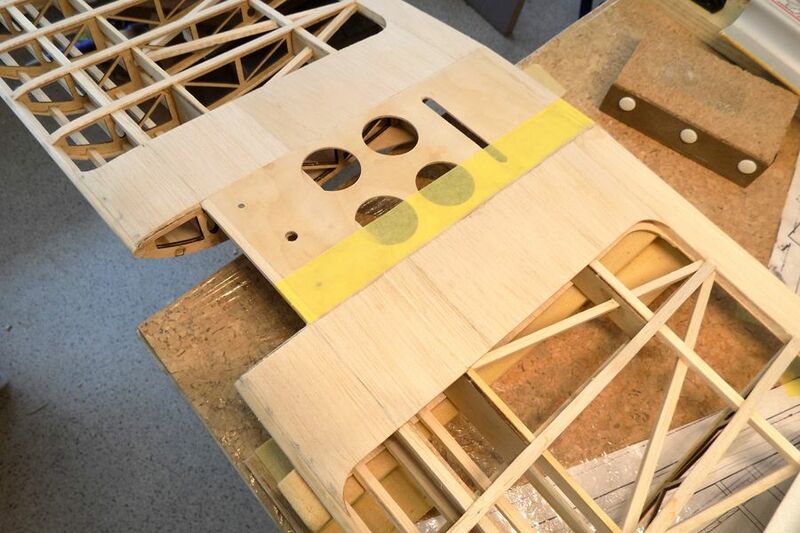 I attacked the shaping of the tailplanes with the ‘standard’ fin and rudder first as a testcase and then focusing on the laminated/triangulated similar parts to bring the LEs and TE to shape. Since the spoofy test stab, I’ve been reconsidering my approach with a first layer of ‘lighter’ pigmented sand sealer (left in the pic) followed by a wash of darker brown (at the right). I think this gives a more ‘natural’ vintage wood staining compared to the darker ‘uniform’ brown of the test piece. Now to be honest, I have no idea how it will appear through the Natural Solartex. I also gave the nylon hinges a light coat of Chinese ink from the local craft store as this German brand is totally permanent and IMO it gives a more realistic result than the standard white plastic. I agree about the white plastic Chris - I paint various fittings also. Well Steven , glad to read I'm not the only 'detailist' around. I'm convinced that if it's a simple or cheap improvement it's always worth considering it. By the way, are you still planning a Vicomte build in some future days? Fine to read the Vicomte is still on your list, Steven. I forgot about your Grumpy Tiger, but I hope it will give a bit of time to proceed with Vicky before your start. I've just seen this, and it brought back many happy memories. I learnt to fly with one of those back in 1985. That was before we had flight stabilisation, and buddy boxes were something you read about but had never seen. Not that it mattered because the plane was just as stable as anything with flight stabilisation. It took off straight and true, but then I had about 10 minutes to learn to steer it enough to point it back at the landing strip. After the first flight, it was refuelled and back in the air within minutes. That was repeated for about 2 hours continuous until the batteries were going flat. By that time, I felt that I was a pretty competent flier, so I progressed to a Mini Super (48" Super 60), which was considerably more lively. IIRC, I soon chucked the elastic rigging because I was more interested in its flying than its looks. 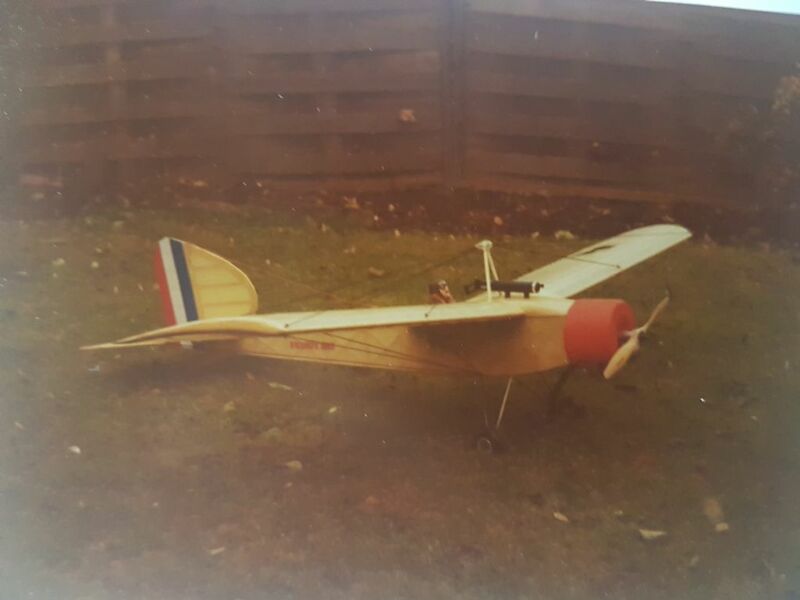 I never crashed it, so I guess I must have given it to someone else to learn on minus the plastic machine gun, which I still have for some reason. Thank you for the nice epos, Dave. 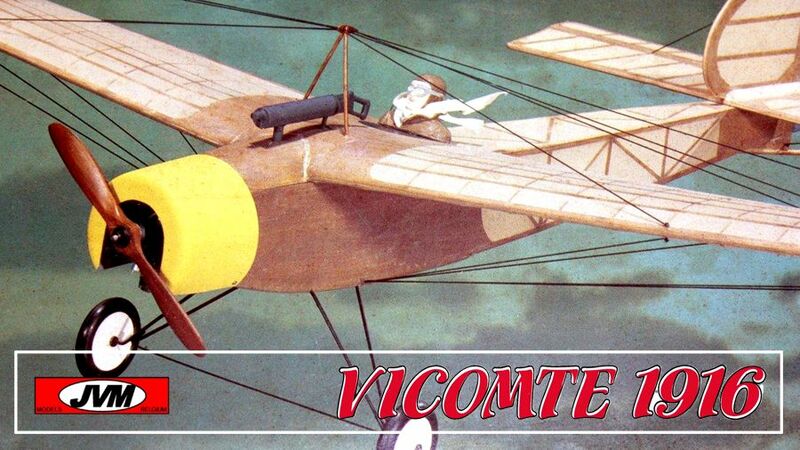 So, in fact there were already some Vicomtes built in the UK. I can remember Djaï from Dubai, Hamish building a scratch one recently and now you're the third. Unfortunately not really enough to make a squadron or organize a 'Coupe des Barons' as they do in France. Following the look of your pilot, the decal at the aft fuselage and the fact that you removed the original "elastic rigging" makes me think that it was an original Svenson Vicomte. Did you build it yourself? or bought it constructed? Thanks anyhow for your story and picture. ... oops... I only realized it way too long after posting my earlier message. Apologies to David Davis as he did build a Baron 1914, which is an early French cousin of the Belgian Vicomte. 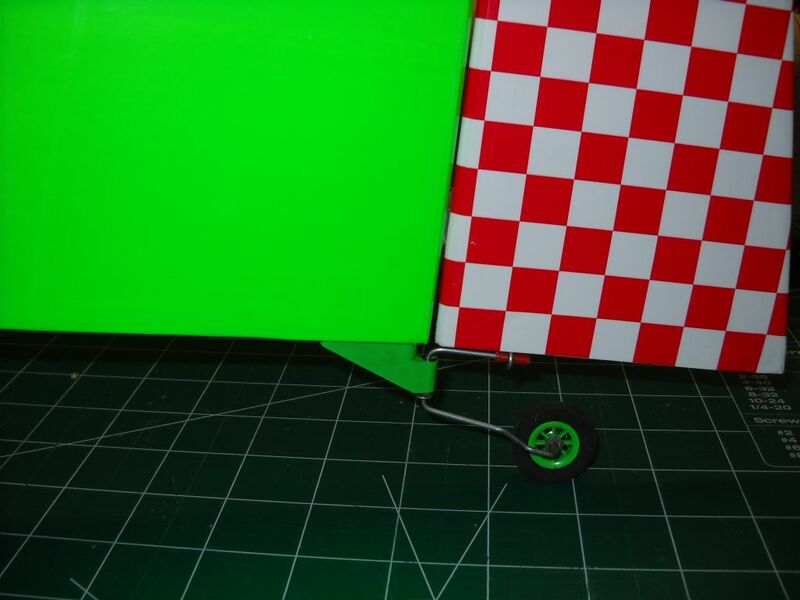 The tailplanes were not the only parts to get my attention while going on building the wing. 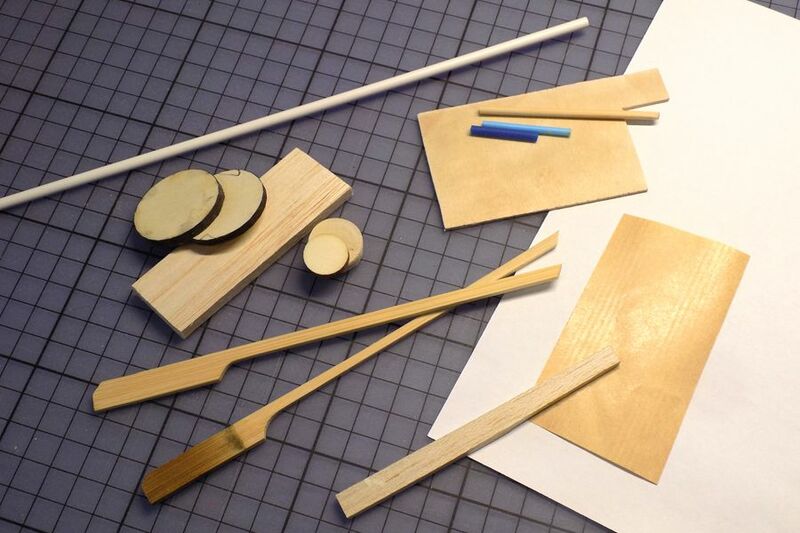 Here’s a pic of mostly scrap bits that I intend to use to 'construct' the next item for Vicky. Bits of thin birch ply and balsa, thicker balsa, poplar ply and balsa roundels in multiple thicknesses, bamboo barbeque skewers, scrap bits of inner rod, Q-tips, styrene rod and finally some copy and brown paper. As this seems perfect for Vicky’s Summer Quiz #2, who will be the first visitor to guess what I’m about to build with these items? It isn't the engine, unfortunately. What makes you think about the machine gun, Martian??? You’re absolutely right regarding the machine gun. This was a bit of a short quiz of course. I’ll have to think about a lot more difficult questions next time. I really didn’t like the original Baron/Vicomte machine gun with a strange shape that only existed in the designer’s imagination and which is also lacking some basic details. I’ve been hesitating between a German Spandau and the half-Belgian (!) Lewis. 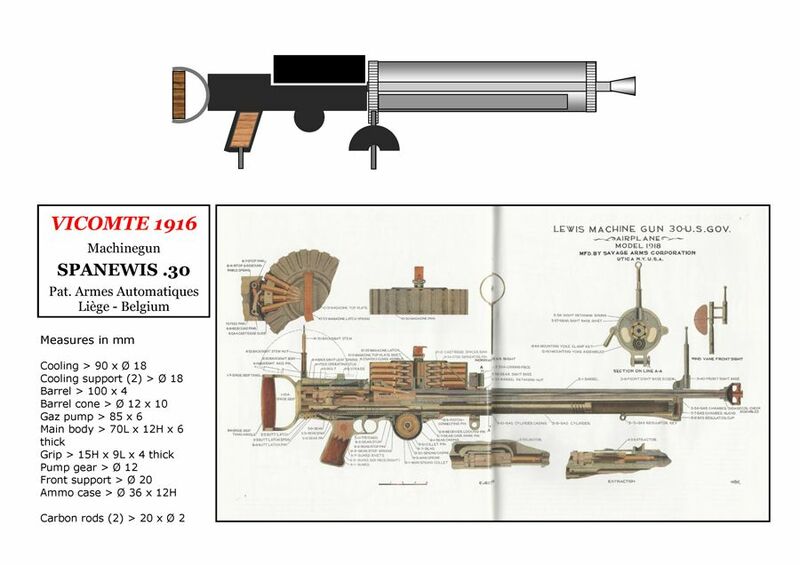 I like the shape given by the cooling mantle of the Spandau but also the distinctive ammo case of the Lewis. Hence, I decided to give birth to the Spanewis 0.30 (please, pronounce ‘Spann-éwis’!). The general shape was planned together with the measures of the different components but obviously some last-minute-mods are going to creep in ‘on the go’. Vicky’s wing might from now on be considered as one single item. 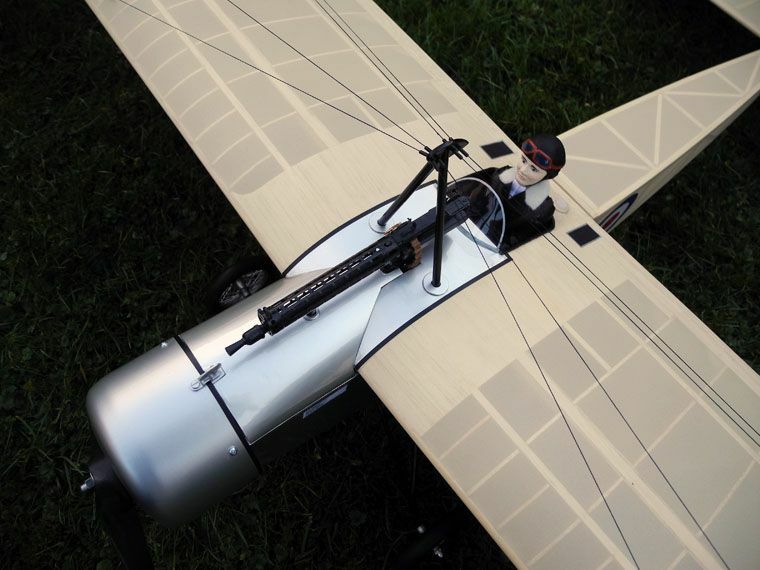 There was only a tiny bit over 1mm difference between José’s and the Svenson dihedral jig when I got the wing in position. The Vicomte’s 1916 one being a tiny bit less, I went for that one. As it is very close to the wing tip, the distance to the center section is larger and that is supposed to help with the desired precision. I just had a light sanding to do at the bottom and repeated the exercise for the top sheeting as well. A final fine sanding will be done just before the wood sealing and tainting but I guess the best is to bring the wing into ‘storage’ as soon as I’ve finished the rear center top sheeting and the office for Pierre, the ‘driver’.